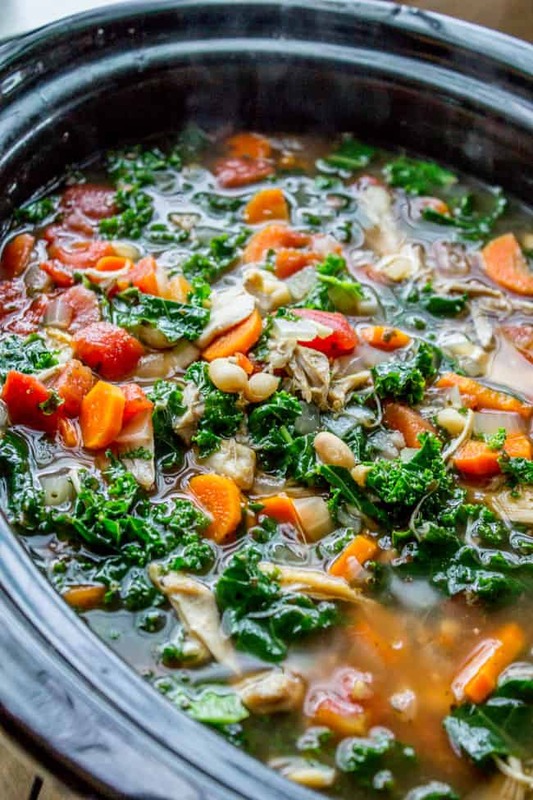 Slow cook your way to a steamy bowl of comforting soup! 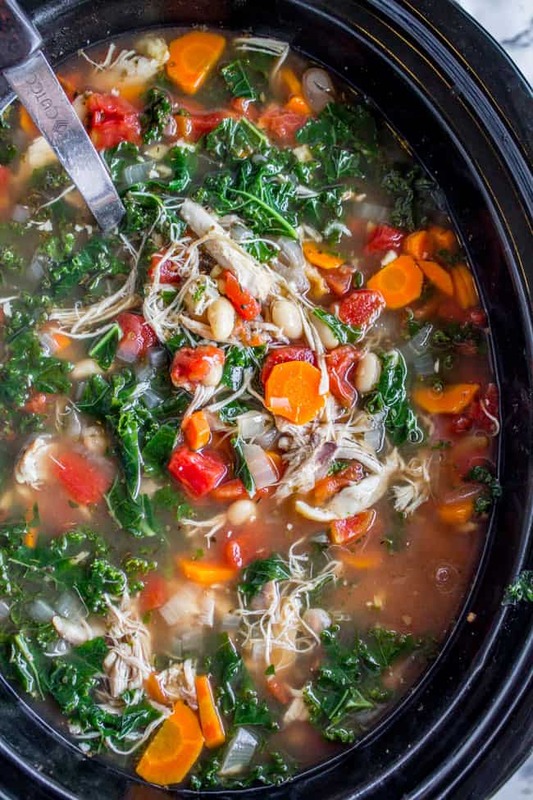 Full of tender chicken, beans, kale, and Parmesan shavings, this easy dinner is healthy to boot. Serve with some crusty bread and extra cheese! I’m slightly offended to be a mere subject in his psychological experiment, but at the same time have caught myself silently “dinging” myself for all sorts of things now as a mini reward. Who knew I was so easy to please? Maybe I’m part canine? A little worried that I’m going to start requesting belly rubs and ear scratches soon. Do not skip that Parmesan rind!! Have you jumped on the kale bandwagon? 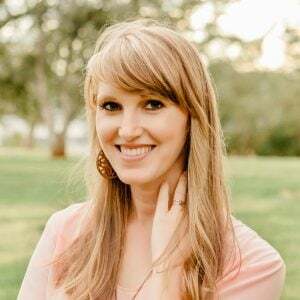 I heard this interview of a restaurant critic on the radio the other day where she totally slams kale. At least, kale as it is often prepared in these trendy times. (Kale salad, kale chips, kale pizza.) She said that years ago grocery stores would leave it on the stands outside during winter, so that it would partially freeze, which made it more tender. And even then it was usually tossed into a soup or stew. 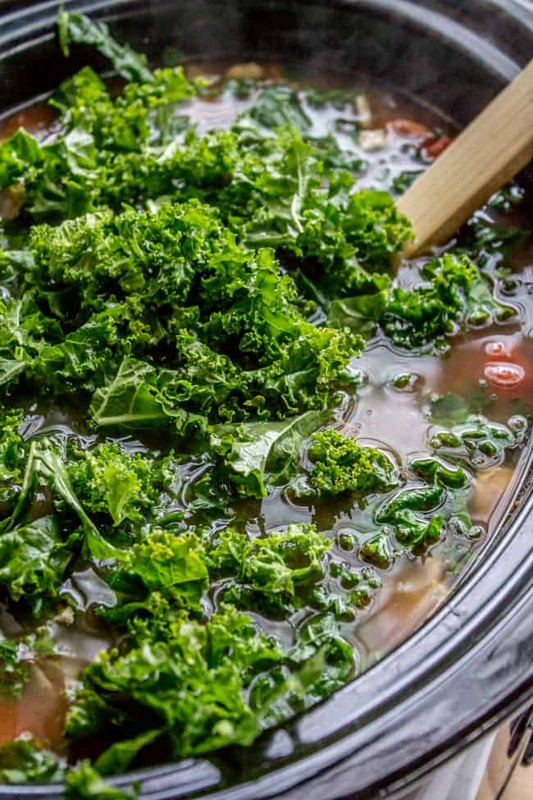 Kale in soup, however, is a completely different story. 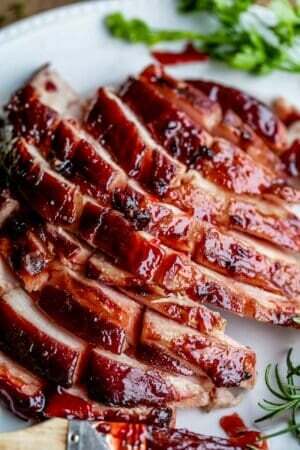 It becomes tender and absorbs the flavors around it. 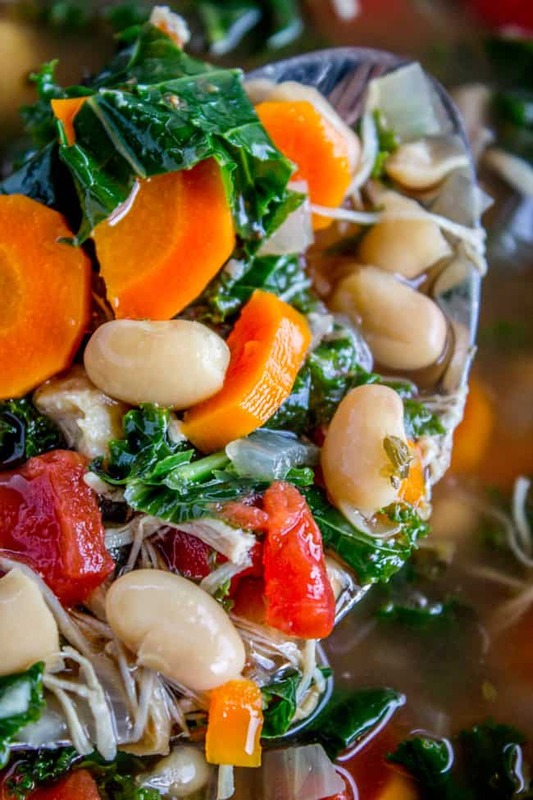 This soup is so hearty and healthy but completely satisfying. I love how versatile it is. Swap out the vegetables, swap out the bean type, etc. 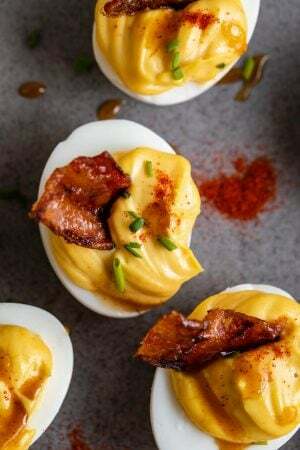 I just talked to my friend Shannon the other day, she’s the one who gave me the recipe, and she said she was going to try it with sausage, which I think would be awesome! Whatever you do, don’t leave out the Parmesan rind. 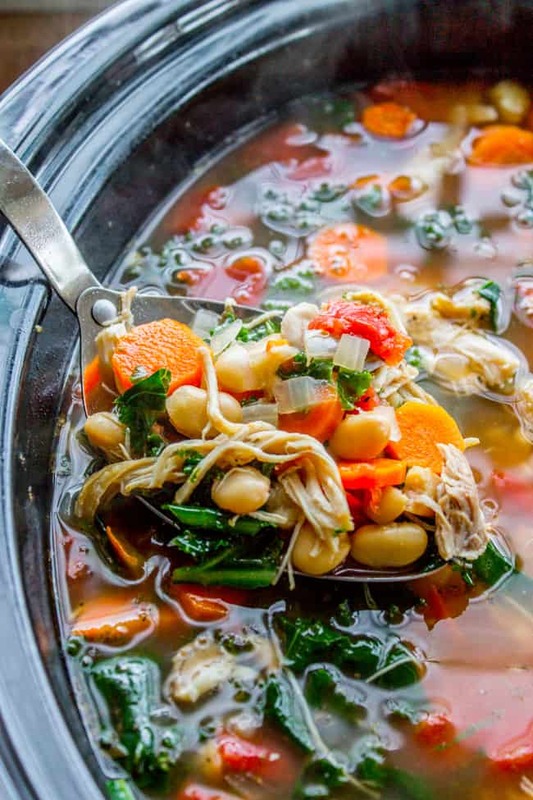 It totally takes this soup above and beyond! 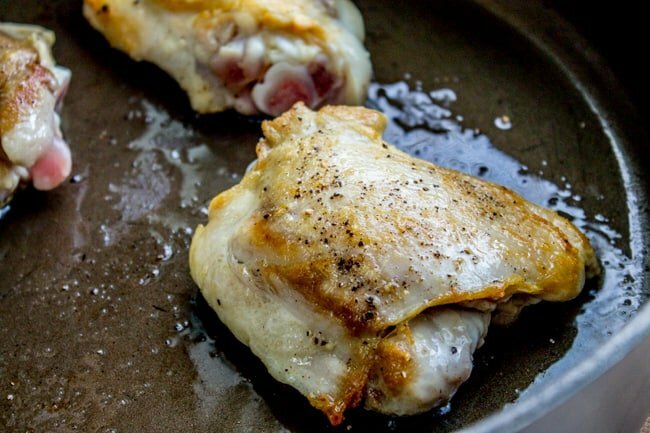 Remove the skin from the chicken and salt and pepper well. Add the olive oil to the hot skillet. When it starts to shimmer, add the chicken. Sear well for 1-3 minutes, then flip and sear the other side until brown. 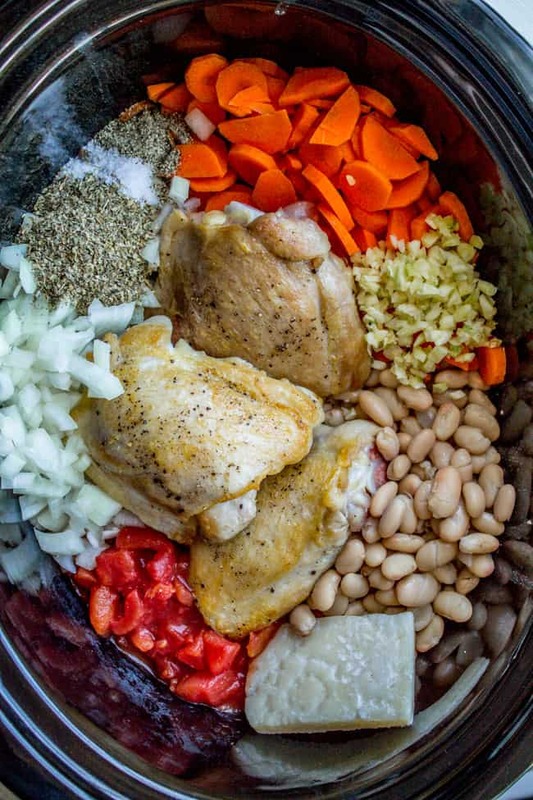 Add the onion, carrots, garlic, diced tomatoes, white beans, salt, pepper, Italian seasoning, chicken broth, and Parmesan rind to a 6-7 quart crock pot. Cook on low for 7-8 hours, or on high for 3-4 hours. 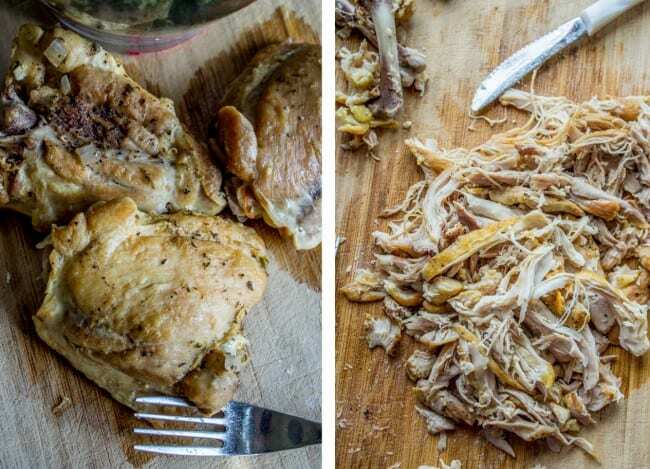 Remove the chicken and shred, discarding bones. Return to the crock pot. Add 6-8 cups of chopped kale, cover, and cook for another 10-20 minutes. 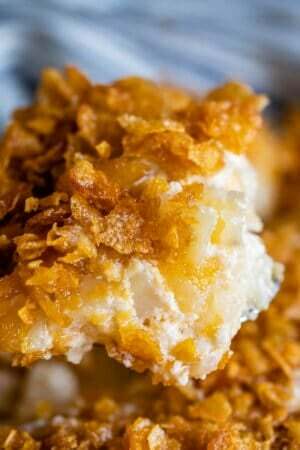 Serve with lots of Parmesan shavings and crusty bread! *You can use chicken breasts if you like. Or, to make this even easier, omit the raw chicken and add about 2 cups of shredded rotisserie chicken. 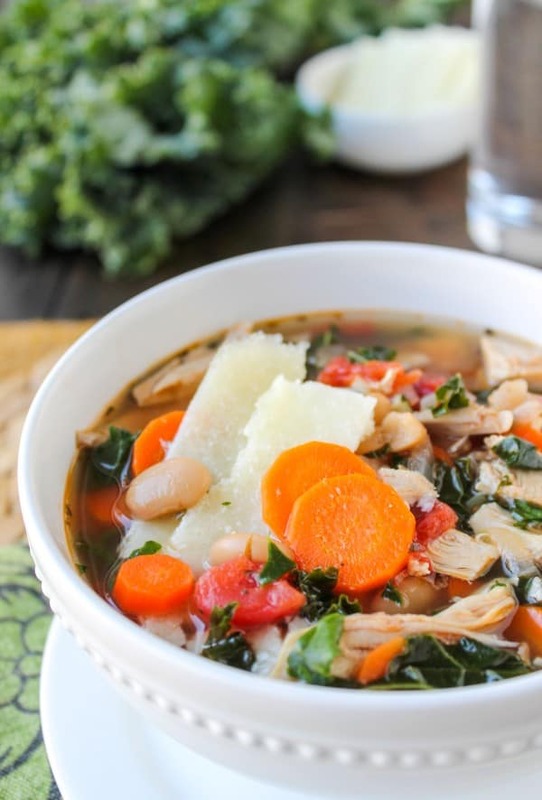 Source: This recipe is from the original Kale, Chicken, and White Bean Soup with Parmesan Shavings, which is adapted from Ciao Annie. More soups you will love! 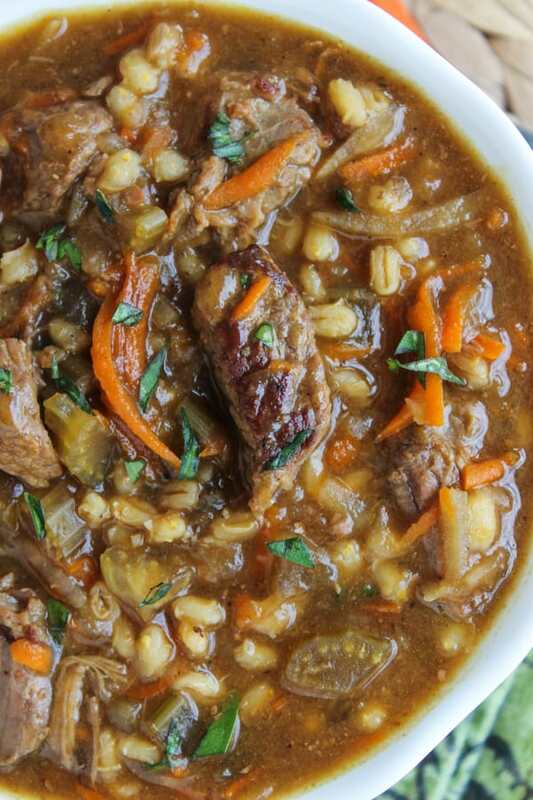 Beef Barley Soup (Slow Cooker) << This is one of the most popular recipes on my site! 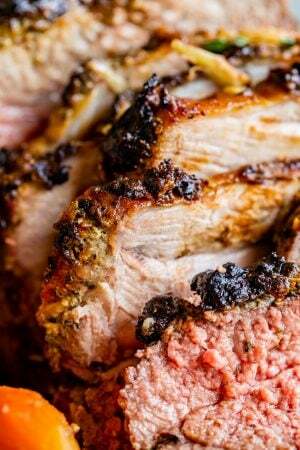 It’s soooo flavorful and delicious! Old family recipe. 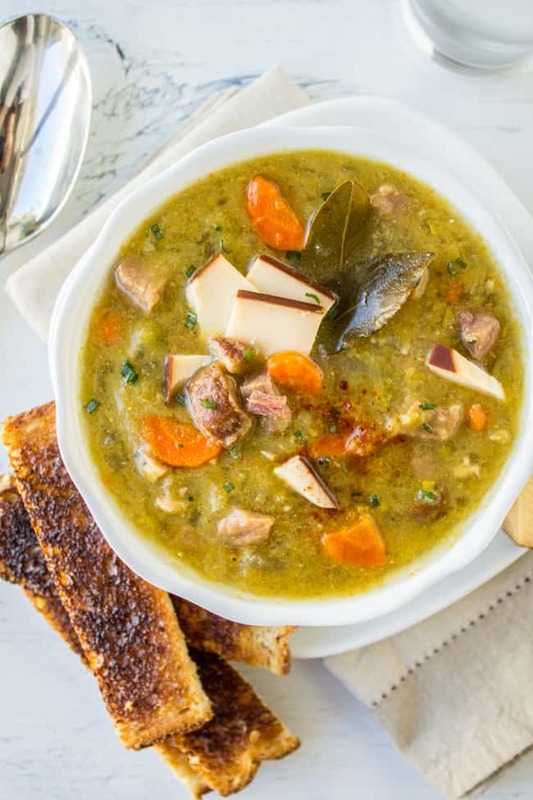 Split Pea Soup with Smoked Gouda (Slow Cooker) << This is a personal favorite of mine! The gouda. I’m tellin you. Don’t knock it til you try it. Next Post » 2-Ingredient Kielbasa Puffs + YA Novel Giveaway! Thanks Mary! It really is the perfect winter soup. I hope you love it if you try it out! 3 bucks?? Good deal I should check that out at whole foods. Elbow macaroni would be an awesome addition to this! And seriously why am I the last person on the planet who hasn’t started big bang theory?